Dextrose stimulates the body to drive, not only glucose but amino acids and other nutrients into cells. * Dextrose thus makes energy readily available to working muscles and helps to maintain glycogen stores. * In addition, dextrose also helps to make important nutrients, such as creatine and branched-chain aminos, available for use by muscle tissue. * From an athletic performance perspective therefore, it can help fuel intense activity, maintain exercise endurance, and support recovery from exercise. Dextrose can be consumed before, during, and after the most intense training sessions. 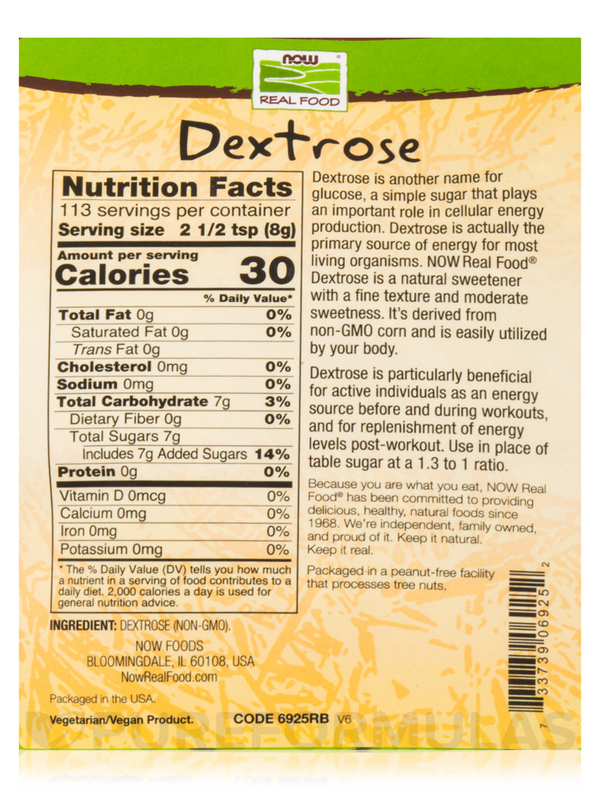 NOW Sports Dextrose is derived from non-GMO corn and manufactured under NOW's strict quality standards.